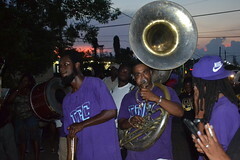 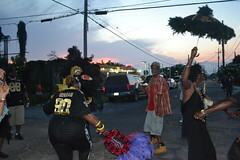 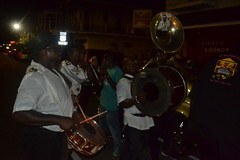 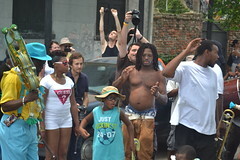 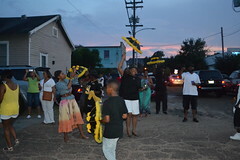 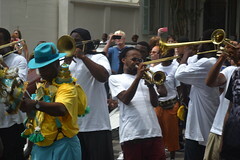 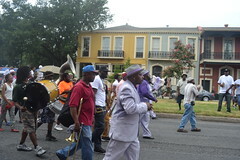 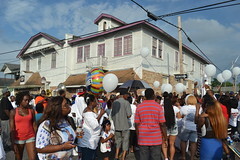 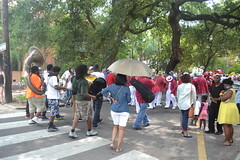 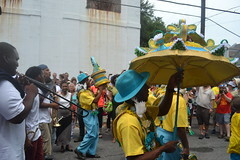 When the jazz mass at St. Augustine’s Church finally ended, the Treme Brass Band came marching out of the church, and the second-line, which had already lined up outside, got underway. 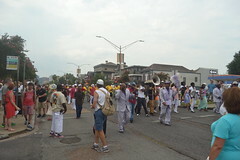 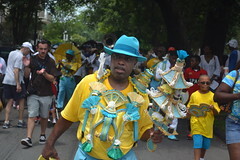 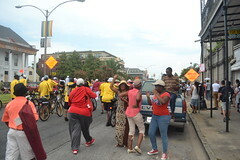 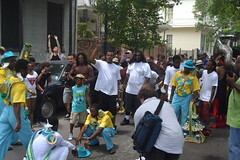 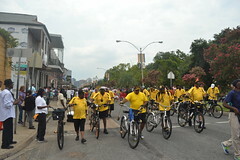 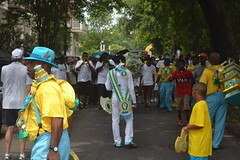 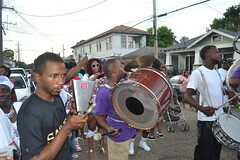 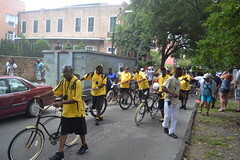 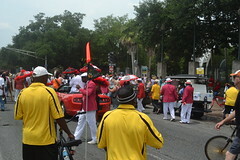 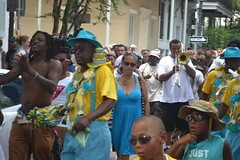 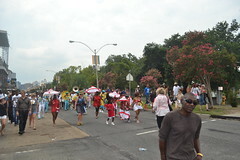 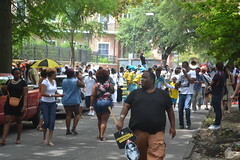 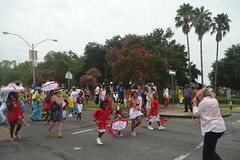 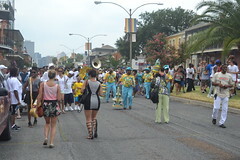 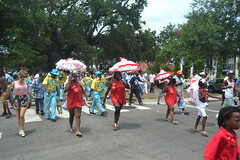 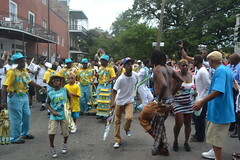 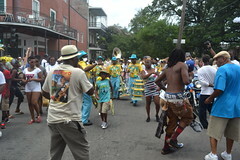 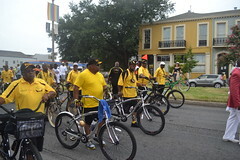 The Treme Brass Band was at the front, with the Baby Dolls and Zulus behind them, and then I walked with the TBC Brass Band, who were marching with the Sudan Social Aid and Pleasure Club, and behind us came the Fi Ya Ya Warriors with their chief and their drummers. 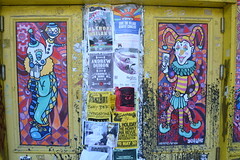 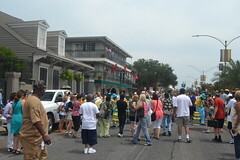 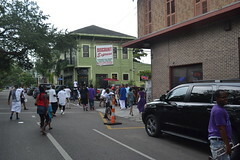 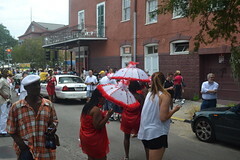 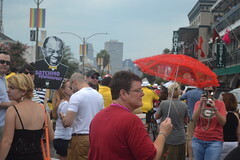 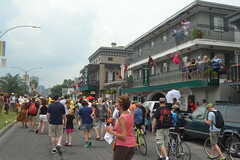 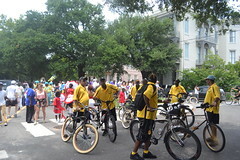 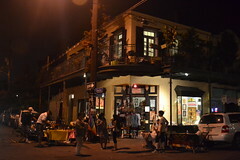 We marched first down to Rampart Street, past a couple of hotels where tourists were cheering from the balconies, and to the entrance of Louis Armstrong Park, which was entirely appropriate given the purpose of this festival. 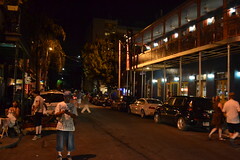 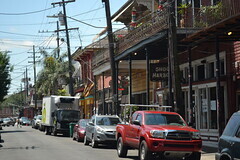 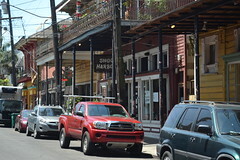 From there, we headed back down Rampart to Esplanade, and down Esplanade toward the old U.S. Mint where the festival stages were located. 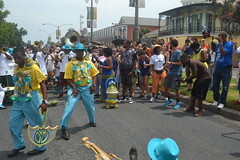 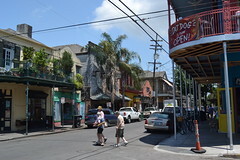 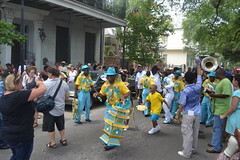 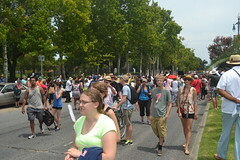 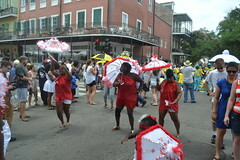 Although I had imagined the second-line as something of an artificial thing scheduled for tourists, I was pleasantly surprised to see it pick up second-liners and buckjumpers as it proceeded down Esplanade. 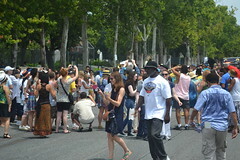 By the time we passed through the festival gates at the Mint, there was hardly room to move. 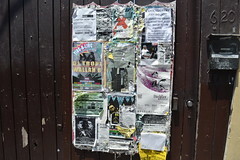 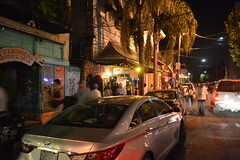 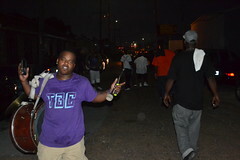 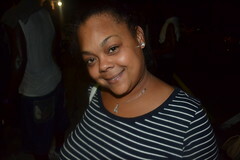 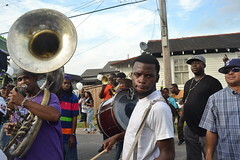 I had meant to hang out at the festival, but I soon found that all of my homeboys in the TBC were leaving out to walk back up toward the Treme, and I was tired too. 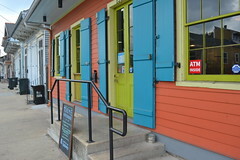 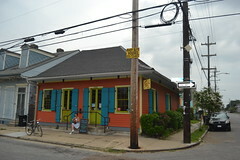 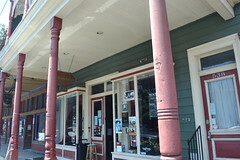 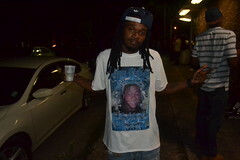 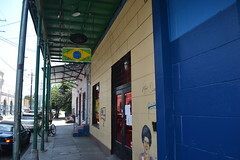 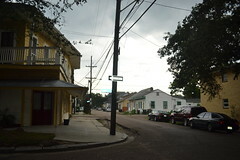 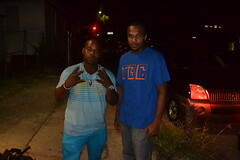 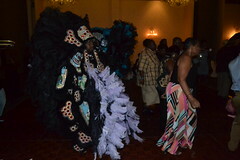 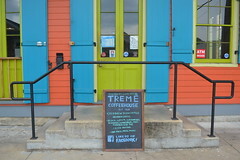 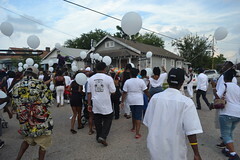 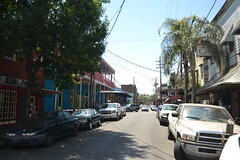 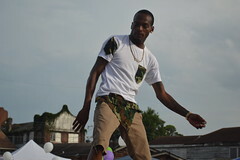 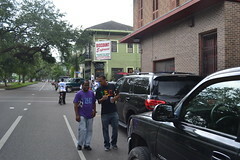 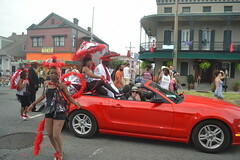 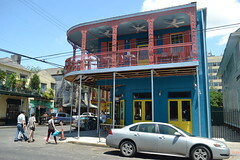 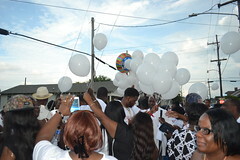 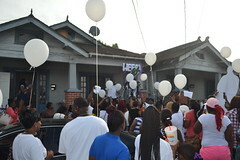 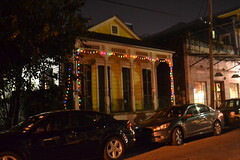 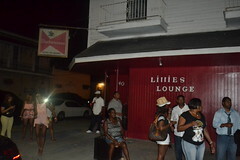 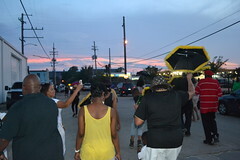 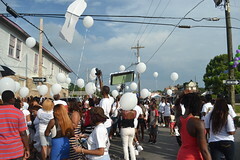 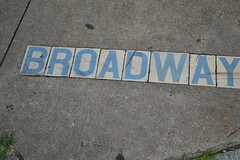 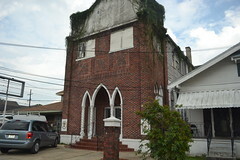 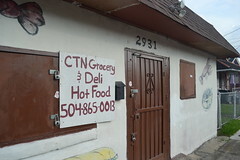 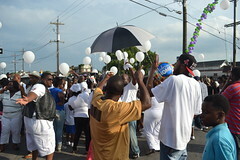 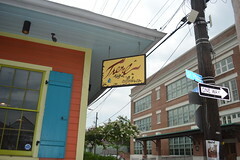 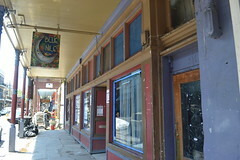 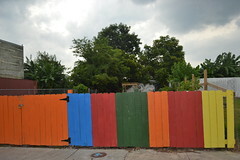 It took every bit of strength I had to walk back up to the Treme Center where I had parked my car. 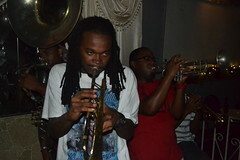 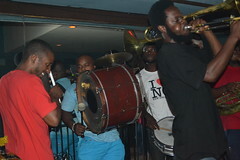 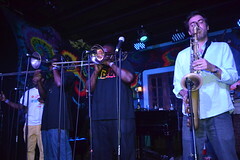 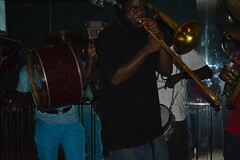 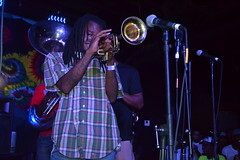 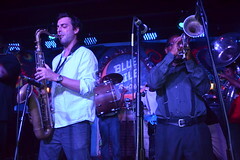 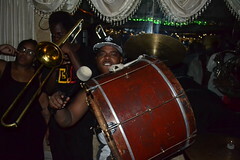 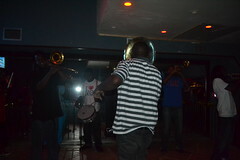 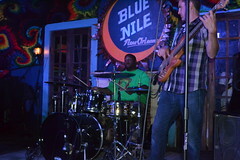 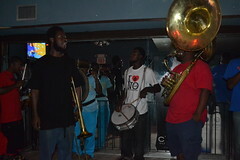 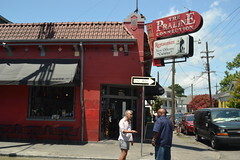 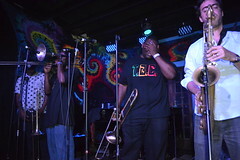 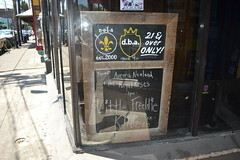 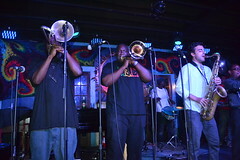 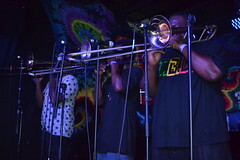 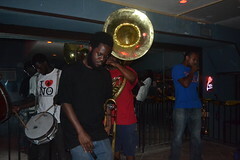 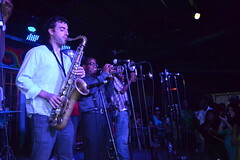 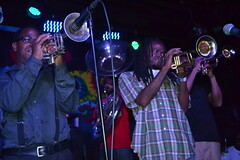 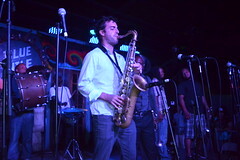 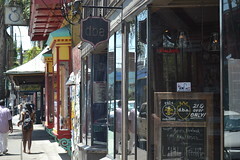 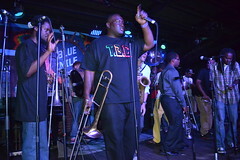 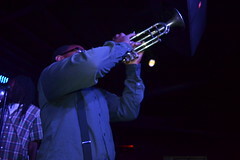 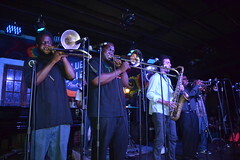 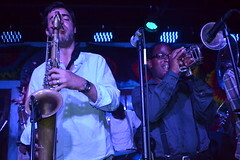 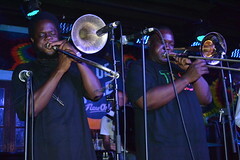 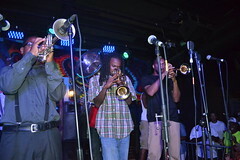 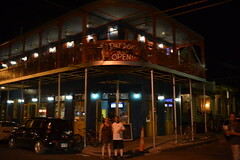 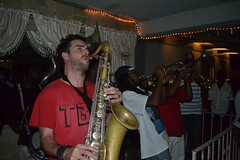 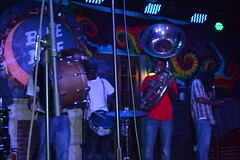 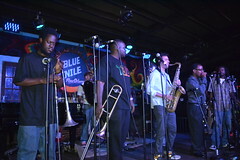 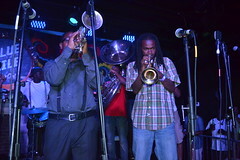 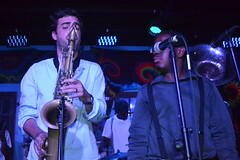 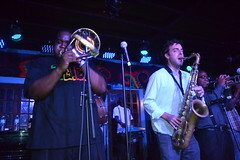 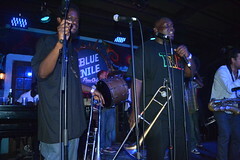 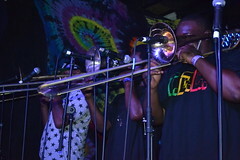 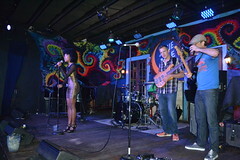 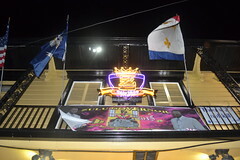 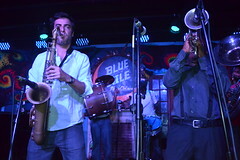 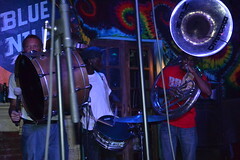 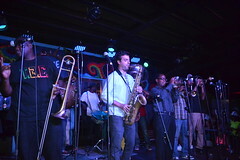 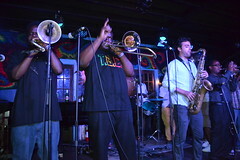 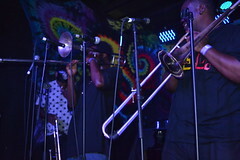 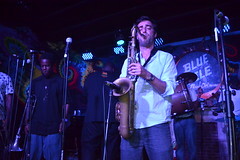 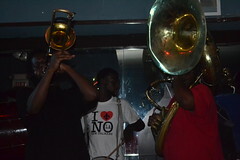 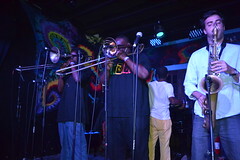 Sunday nights at the Blue Nile have been a long-running regular set for the To Be Continued Brass Band (also known as the TBC Brass Band), who are one of New Orleans’ premiere brass bands. 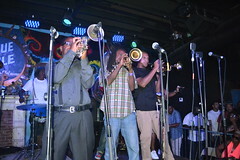 2014 has been a stellar year for the band so far, as they just recently performed with the legendary Wailers tag the House of Blues, and at Jazz Fest. 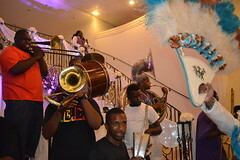 Even more impressive is the fact that, unlike many New Orleans brass bands these days, the TBC never uses the expedient of replacing the snare and bass drums with a set drummer, or of adding electric bass or guitar to the band when indoors. 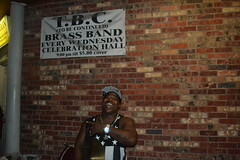 The combination of authenticity and youthful street swagger is what makes the TBC Band unique. 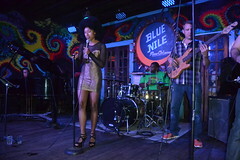 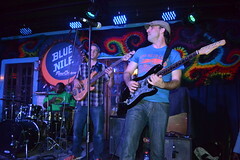 Unfortunately, with Sunday evening being a holiday evening, the Blue Nile was filled far beyond the usual crowd level on a Sunday, and there was heavy drinking going on. 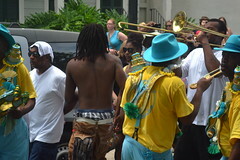 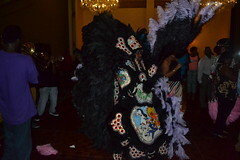 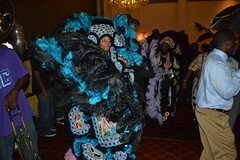 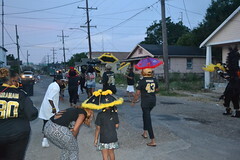 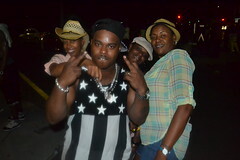 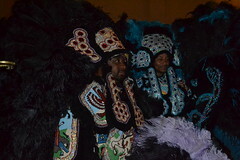 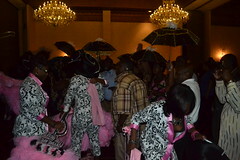 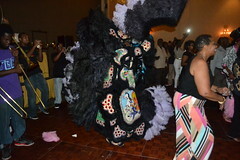 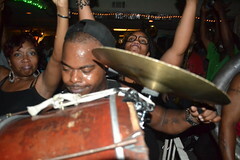 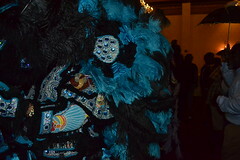 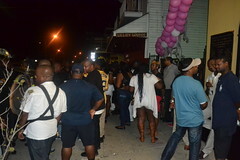 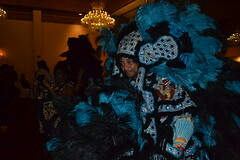 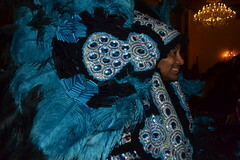 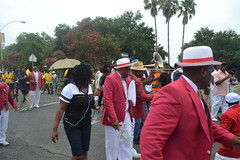 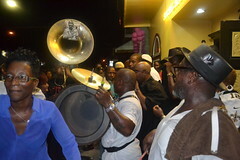 Although the band was great as always, I soon found myself being bumped, then pushed, then showered with liquor from people around me trying to dance or second-line while they had cups in their hands. 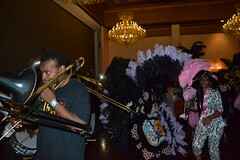 Working my way back from the stage didn’t work, because the place was filled far beyond capacity, so reluctantly I cut my losses and left. 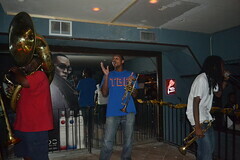 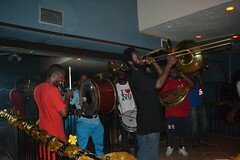 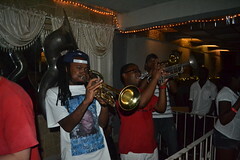 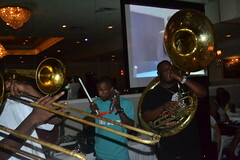 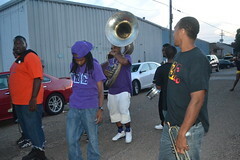 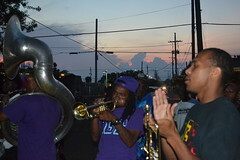 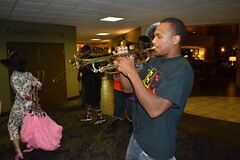 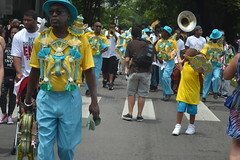 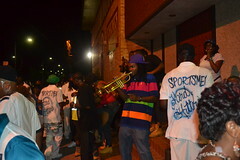 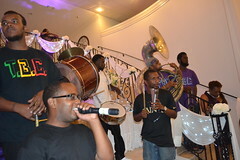 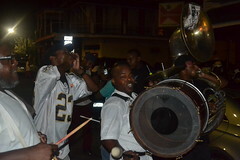 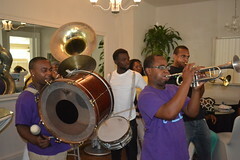 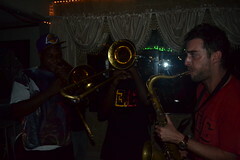 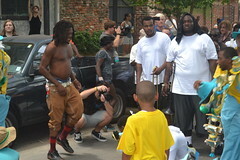 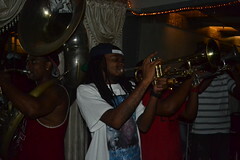 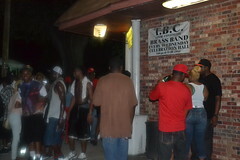 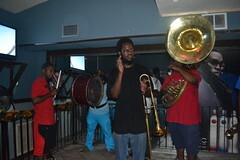 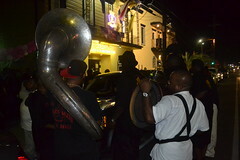 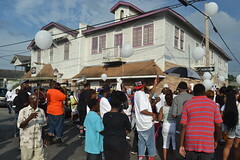 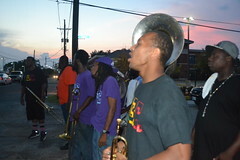 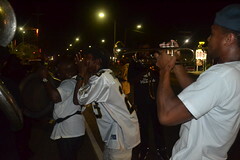 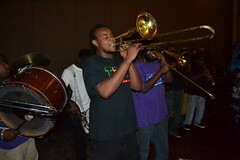 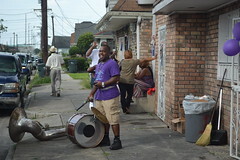 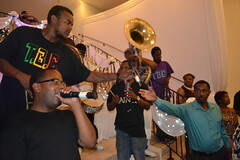 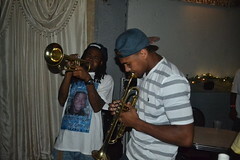 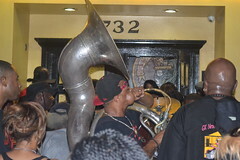 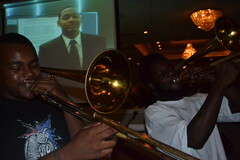 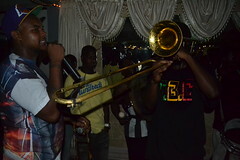 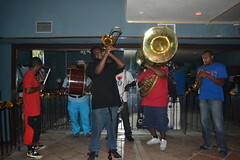 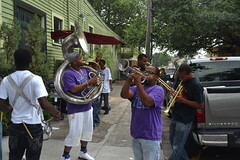 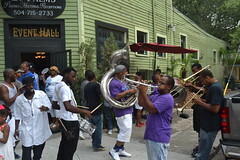 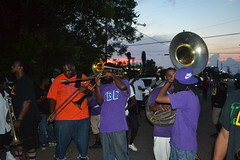 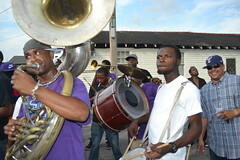 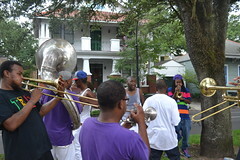 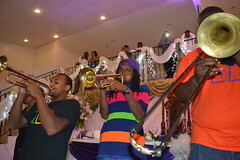 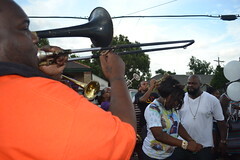 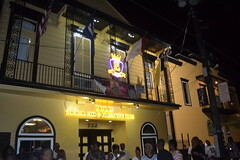 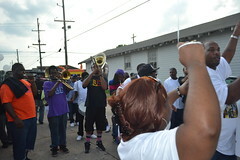 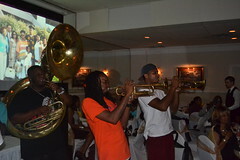 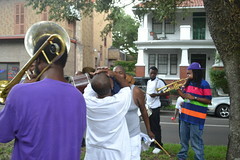 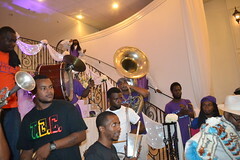 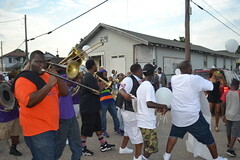 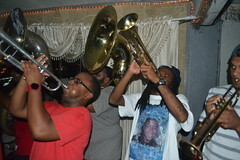 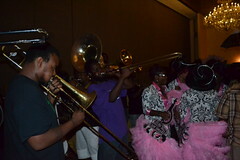 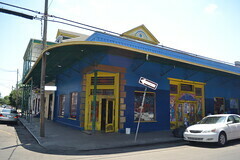 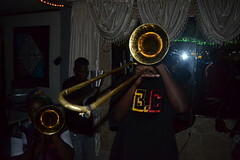 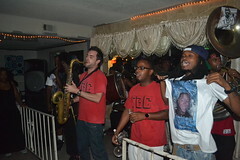 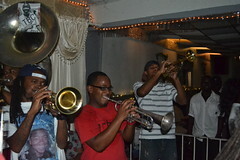 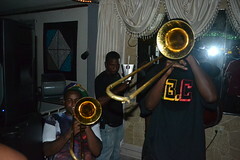 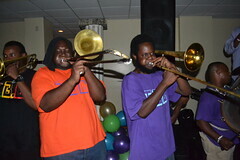 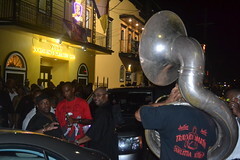 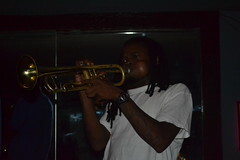 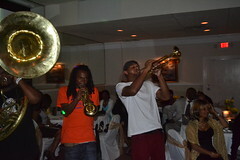 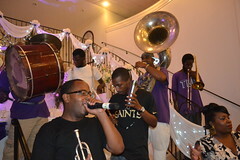 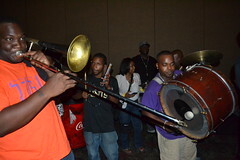 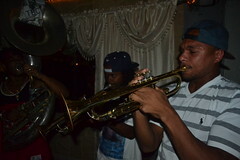 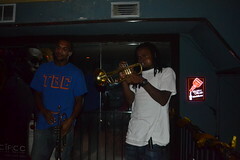 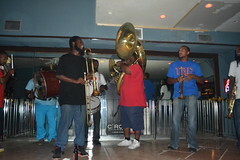 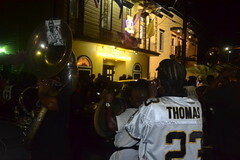 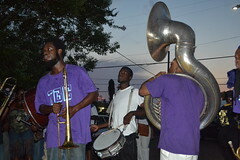 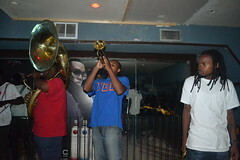 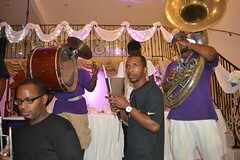 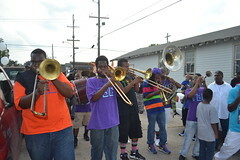 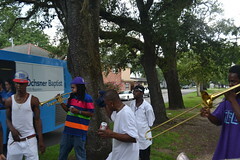 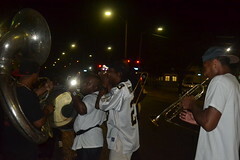 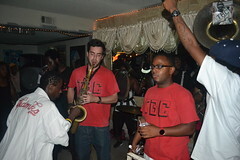 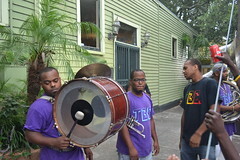 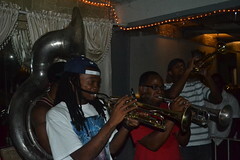 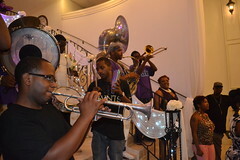 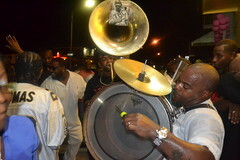 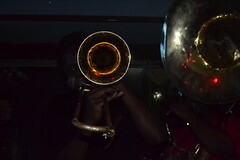 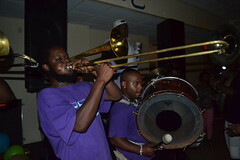 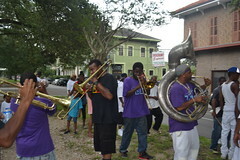 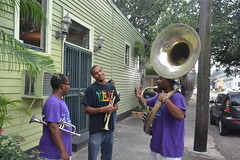 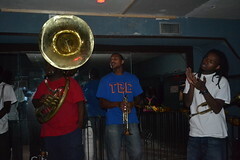 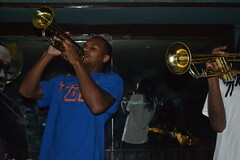 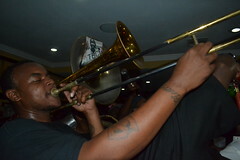 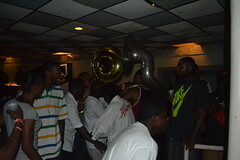 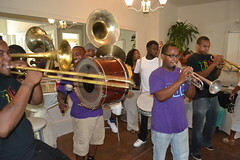 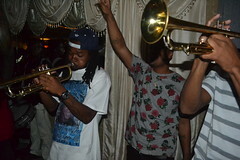 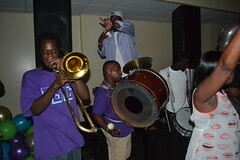 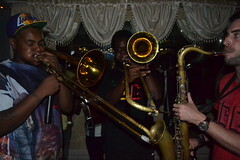 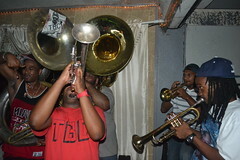 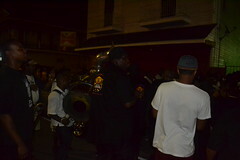 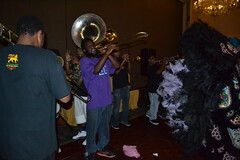 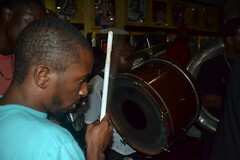 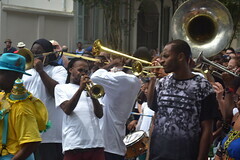 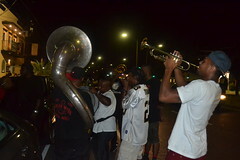 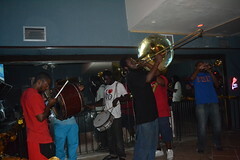 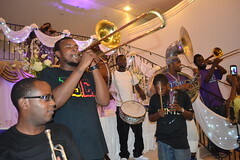 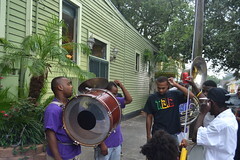 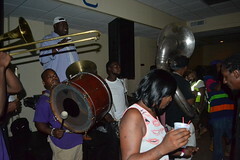 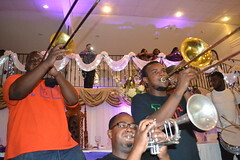 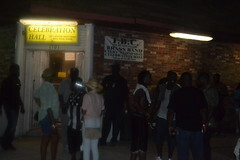 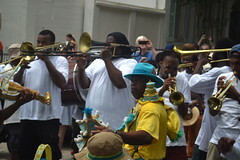 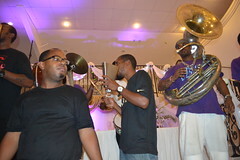 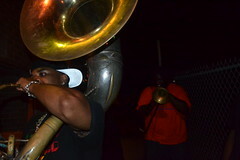 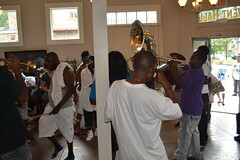 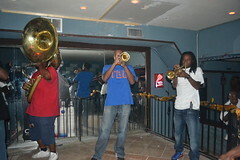 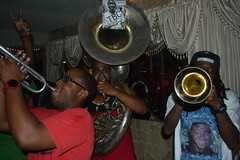 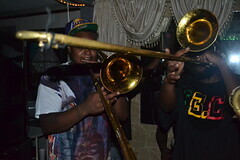 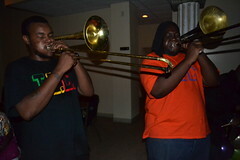 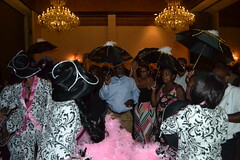 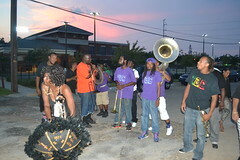 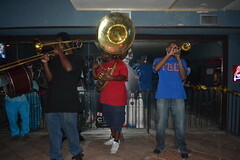 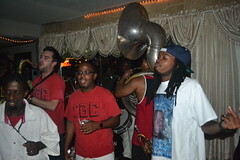 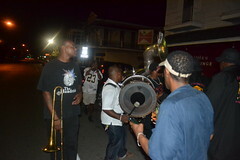 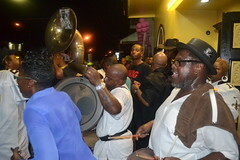 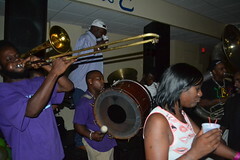 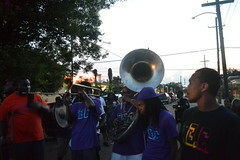 Every Wednesday, the TBC Brass Band plays at Celebration Hall on St. Bernard Avenue in the 7th Ward of New Orleans. 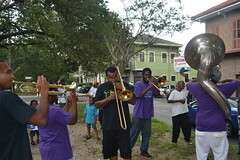 All brass band performances are fun, but the ones in neighborhood spots like this one are particularly fun, as the band is playing for its friends, neighbors and relatives, and there’s just a different vibe from when they play for tourists in or near the Quarter. 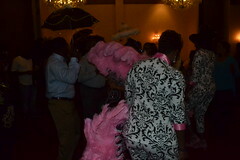 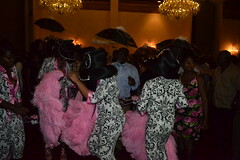 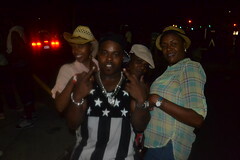 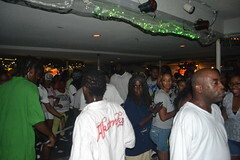 The dancing is more exuberant, the music more blazing. 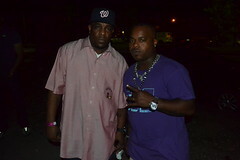 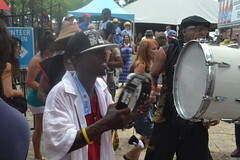 The crowd was full of people I recognized from other bands, the Hot 8 and the Stooges Brass Band. 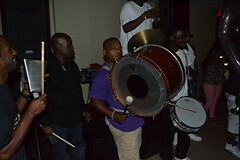 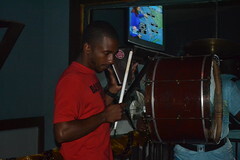 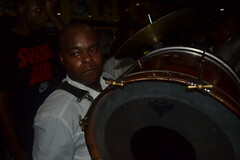 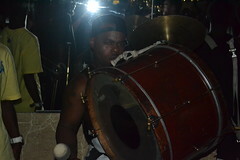 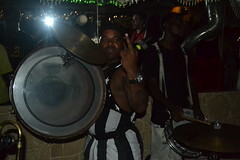 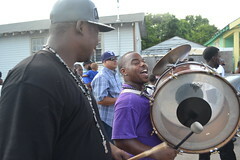 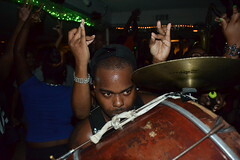 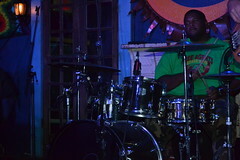 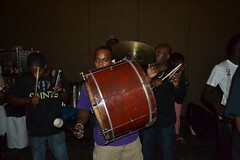 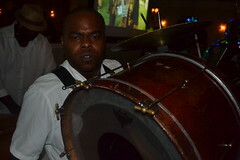 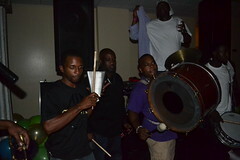 My homeboy Darren Towns was rock-solid on the bass drum, aided by a snare drummer and at least two cowbell players. 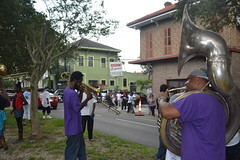 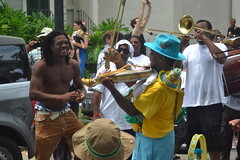 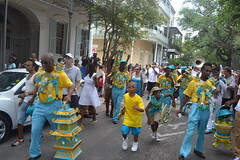 And the cowbell players play an important role in brass band music in New Orleans, helping to convert the feel of the music from traditional marching patterns to something more Caribbean or perhaps even African. 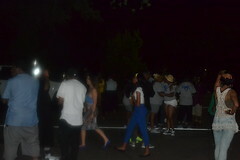 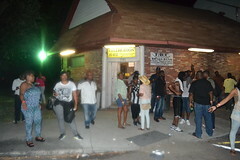 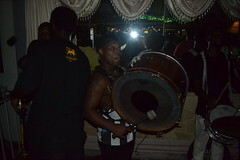 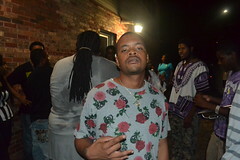 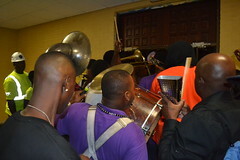 At the end of the night, the band marched to the door to lead us all out, but nobody wanted to leave. 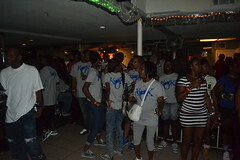 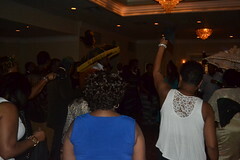 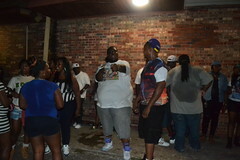 You really never do when the music and the footwork are this good. 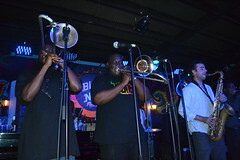 Of course, the highlight of the night for me was getting to see my absolute favorite New Orleans brass band, the TBC Brass Band at the Blue Nile on Frenchmen Street. 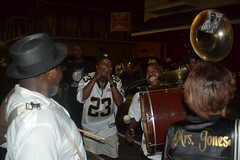 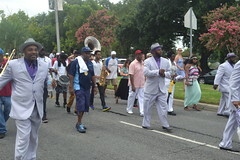 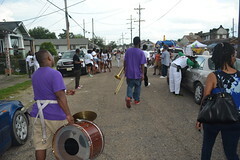 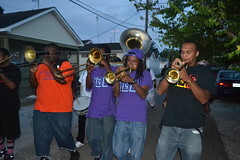 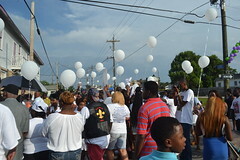 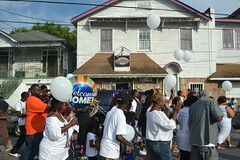 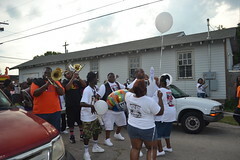 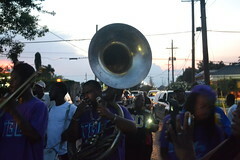 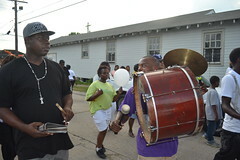 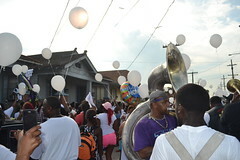 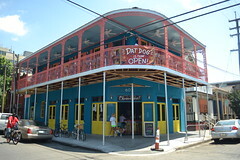 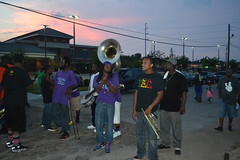 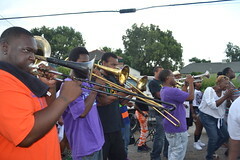 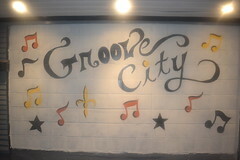 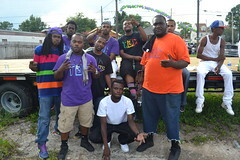 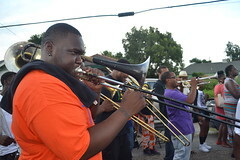 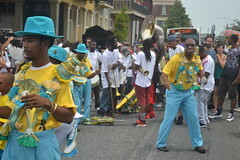 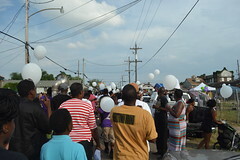 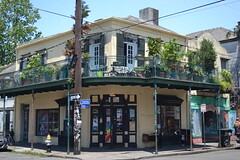 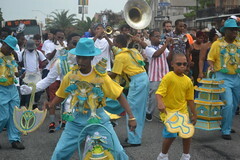 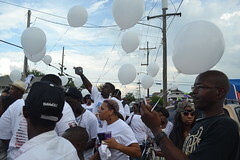 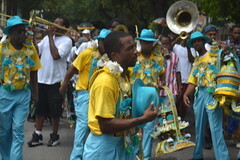 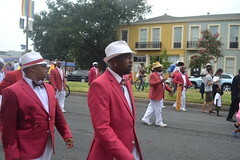 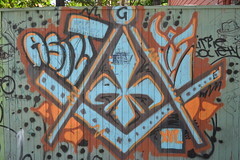 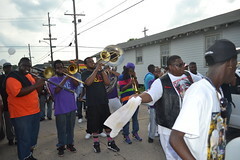 These young men, most of them from the 9th Ward, had only recently come together prior to Hurricane Katrina, and for a time it seemed that the storm might have brought the band’s brief existence to an end, with members scattered to other cities. 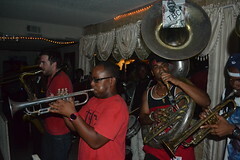 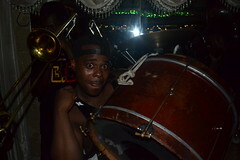 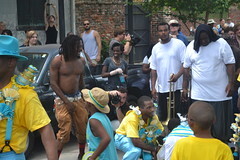 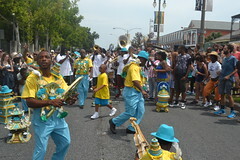 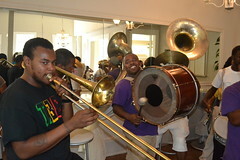 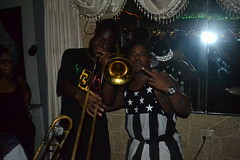 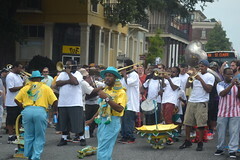 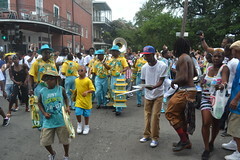 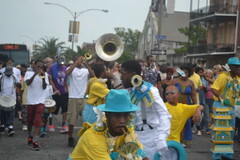 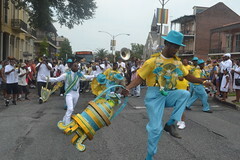 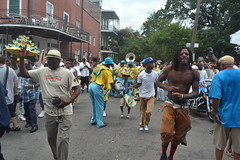 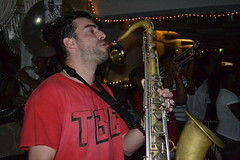 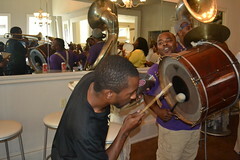 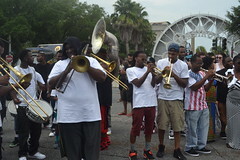 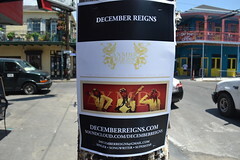 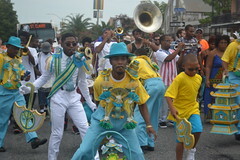 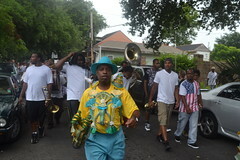 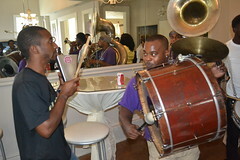 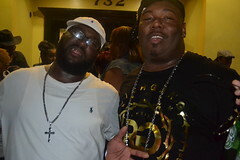 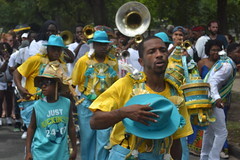 But the To Be Continued Brass Band beat the odds and came back together in New Orleans, and is a group that brings a rough, defiant, hip-hop attitude to the world of brass band music. 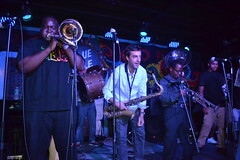 So I was somewhat amazed to hear them start their Blue Nile set with a couple of tunes from the traditional brass band and jazz repertoire, something I had never heard them do before. 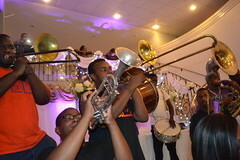 Their reading of “I Found A New Baby” was joyful, upbeat and flawless, with a skill that belies their youth, and was a tribute to their versatility as a band. 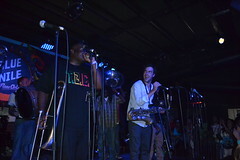 Eventually the set moved into their usual more contemporary material, but I left at the end of their show with a whole new respect for the TBC’s musicianship. 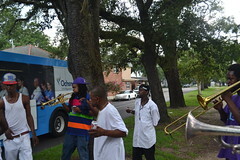 My friend Travis and I arrived at Jackson Square and ran into my homeboys from the TBC Brass Band, who had been hired to lead a wedding procession from St. Louis Cathedral to Galvez Restaurant on the other side of Decatur Street. 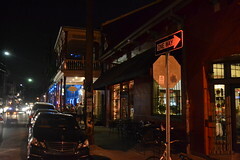 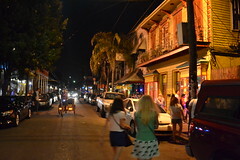 Of course, in New Orleans, nothing ever happens as planned, and the wedding proved to take a lot longer than expected, but seeing the comings and goings on Jackson Square on such a pleasant night was fun in its own right. 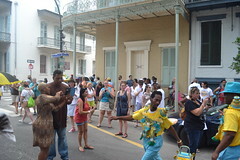 One strange, wheeled contraption was comprised of a number of drums and gongs which a man was playing as he wheeled it around the square, and several groups of tourists were walking around on “haunted” or “voodoo” tours. 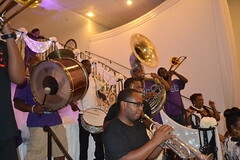 Eventually, however, the wedding party emerged from the church with the bells ringing from the cupola, and the TBC band struck up to lead them on their way. 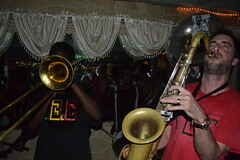 They of course played a more traditional style than their usual repertoire, but it was still exciting. 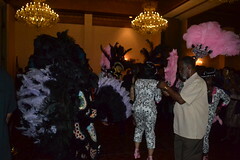 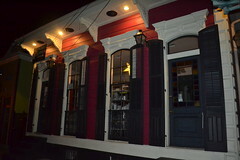 Once they arrived at the Galvez courtyard, they kept playing until everyone had entered the restaurant, and then they disappeared into the night.